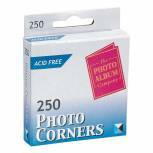 TPAC Photo Corners White (Pack of 250) PC250 Pack of 1 Photo Corners. Acid free, transparent, self-adhesive photo corners supplied in a handy dispenser box. Colour - White. 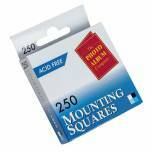 TPAC Photo Mounting Squares White (Pack of 250) MS250 Pack of 1 Photo Mounting Squares. Double sided, acid free, self adhesive photo mounting squares supplied in a handy dispenser box. Colour - White.